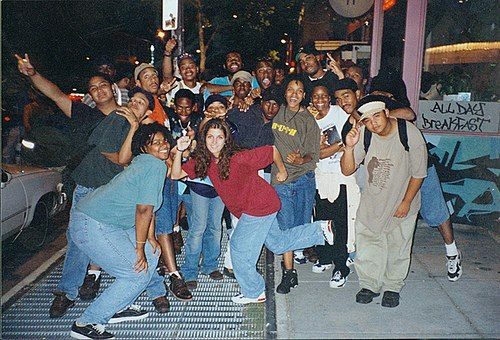 I started organizing and facilitating Cyphers in 1994. Young, in love and idealistic not only about Hip Hop but the world. 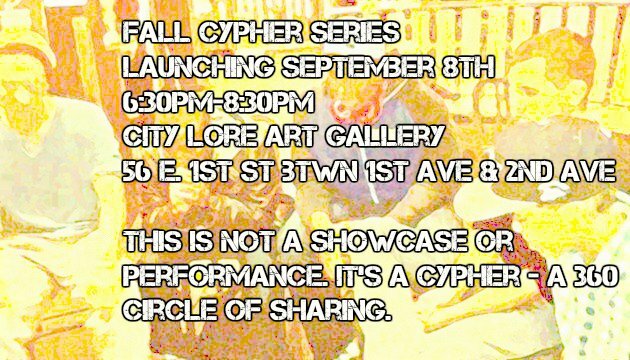 I had a vision for using freestyle Cyphers as a way to promote artist responsibility, preserve the oral tradition and bring crews together. The event started at State of the Union, a bar on U St in Washington, DC. It was called Talking Heads but I soon realized that the stress of two drink minimums was killing my vibe. I also discovered that even the MC’s who drink don’t drink much while rhyming. The artists were coming to the event to build skills. Kenny Carroll and Brian Gilmore, both professional writers and poets, were DC natives who outside of their day jobs recited with a collective, hosted events and readings and didn’t mind spending hours waxing poetic on any and everything from the science of Parliament Funkadelic to the history of Mambo Sauce, local, national and global politics and there was no limit to their knowledge of poetry. Their circle of writers could speak to Anne Sexton as well as they could Amiri Baraka or Lucille Clifton. They were like big brothers. Not only did they teach me a lot but they also supported, encouraged and challenged me to do what I do. That’s how I ended up at a place called 8-Rock on Martin Luther King Avenue and Good Hope Rd in Southeast Washington D.C. hosting Cyphers in the land of GoGo. Initially I called the Cypher, Freestyle Fellowship because a good cypher always made me think of a spiritual experience. My childhood reference for getting open started in St. Mark Baptist Church in my Bay Area hometown in California. However, a week after the flyers were made, a fellow Hip Hop head handed me a Project Blowed Mixtape. Freestyle Fellowship was on it. My mind was blown by what I was listening to and it was proof that when a concept is out in the universe there can be a number of people thinking and feeling the same exact thing on opposite sides of the country or planet. I was kinda’ amped and proud that the group Freestyle Fellowship was coming out of Cali too. Freestyle Union Cipher was born. In the 90s Cypher was spelled with an “i” but the “y” spelling has become more popular over time so I thought I would evolve with the times. I added workshop to the end of the name after the Cypher started to grow. It was becoming bigger and all kinds of personalities were showing up. I interned for a year with a media training firm in DC and received Train-the-Trainer training. One of the key insights I gained from the training was how important it was to focus on activities and creating an environment for participants to get from point A to point B in a set amount of time. I added “workshop” and called it Freestyle Union Cipher Workshop to keep the hard heads out. There was no budget so we didn’t have security. My theory was that the only people coming to a workshop were people who wanted to work, develop and build. It worked. 300 Cyphers and never had one fight. There were a few emotional outbursts by MCs who got frustrated with themselves or the process but that’s about it. When I first moved to NYC I reconnected with a number of people who I met working in the arts with Kim Chan, who was then a DC based arts professional, over the years. At one point I thought I wanted to become a professional arts presenter but after co-producing a Hip Hop Festival with the Smithsonian and Washington Performing Arts Society I realized I’m way too much of an artist to focus on developing that skill set. Professional arts presenters like Laura Greer, Maureen Knighton, Baraka Sele and Micki Sheppard showed me incredible amounts of love. Linda Walton, Bob Holman, Lois Griffith and Miguel Algarin also embraced me as a poet, MC and arts organizer. I met Steve Zeitland, co-founder of City Lore Foundation, through Bob and he became one of my arts mentors and I am excited to be working with him again. Please Note: My book, Wisdom of the Cypher, will be released this fall. This entry was posted in Music, Poetry, Reflections and Introspection, Hip Hop Ambassador Work, Rhyme like a Girl, Freestyle Union, Hip Hop Education, Inspiration, Artistic Development and tagged Toni Blackman, Freestyle Union, Freestyle Union Cipher Workshop, Wisdom of the Cypher, Toni Blackman Cypher Workshop, DC Hip hop, City Lore Art Gallery, Cyphers, Cypher, Cypher Jam Sessions, Cyphers NYC, Cyphers in New York, Hip Hop Workshops, MC Workshops, Hip Hop History, Toni Blackman History. Bookmark the permalink. I joined up. Finally in one place so will chime in soon!! !